The e-version is a Classic version specially adapted to the Internet and can be downloaded and used immediately. 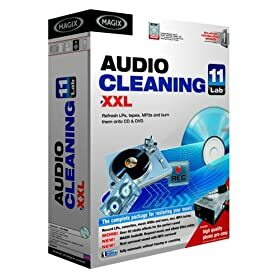 Record, restore, burn: MAGIX Audio Cleaning Lab 11 e-version is the perfect tool for restoring your sound on your PC. Automatically remove crackling, hissing and humming from LPs, cassettes and MP3s and burn onto CD or DVD. An audio-visual experience! The new interface in MAGIX smart look brings you to where you want to go even faster. Intelligent structure, optimized and accelerated work flows, more effects with direct access and an appealing, bright design for even more fun with your music. Musical fingerprint! The latest technology, MAGIX AudioID from the Fraunhofer Institute (inventor of the MP3 format) provides title, album, genre and other information, for individual music tracks as well. Simply record or import an old mix tape or any music title, create a fingerprint at the touch of a button and access information from a huge database. Previous services like FreeDB or CDDB only recognize the information for complete albums, not for individual songs. Big sound, small memory! As the first software in its category MAGIX Audio Cleaning Lab 2006 supports importing and exporting brand new standard surround formats from Fraunhofer. MP3 surround provides compressed multi-channel sound in high quality with low space requirements. It can be used almost everywhere: on PCs or in new DVD players, in car radios or in portable devices. No more 'S'! Reduce annoying 'S' sounds from speech recordings or old vocal recordings. Simply select male or female speakers and reduce the 'S' sound to a natural level with the slider. Repair old radio plays, your own speech recordings or your old jazz records with the new DeEsser. Quick fine-tuning! Parametric Equalizer with large control panel and 4 handles for quick and easy fine-tuning. Experts use the Edit Mode to access further parameters. Dream room! The innovative and excellent studio reverb effect device with fantastic stereo sound will impress every music fan and really raises the bar with its ultra-realistic reverb algorithm. Various reverb models are combined, giving your recordings real space and depth, and separating your sound from more 2-dimensional effects. Those who just want to start playing straight away can use the pre-programmed effect settings. Perfect for breathing new life into recordings or as surround reverb for a 3D musical experience. Overmodulation is a thing of the past! Remove annoying noises and distortions from digital and analog overmodulation with the new MAGIX DeClipper. Whether it's old records, low-quality MP3s, cassettes recorded with high modulation or simply old radio programs, in just a few clicks you can transport your valuable music into the digital age. It doesn't get any faster than this! The easy-to-use Quick Faders now give you quick access to the Equalizer, SoundCloner, BrillianceEnhancer, DeClipper and Compressor. The ideal control center for your digital music archive! Compile and burn entire music collections with only one click. The right sound for the right occasion. MP3 is the symbol for mobile music and MAGIX Music Manager supports even more formats: MP3, OGG Vorbis, WMA (incl. DRM) and WAV – from the Internet or CD, for hard disks, USB sticks and portable devices.